The original powersport connector is now so much more. Designed for simple plug and play operation, the Powerlet Equipped System can power any electronics from a single Powerlet 12V outlet. From iPods to mini-usb devices and from heated clothing to battery chargers, one Powerlet connector does it all. A typical inflater will take about 6 minutes to inflate a rear tire to 40psi. Naturally, better tire inflaters will take less time. 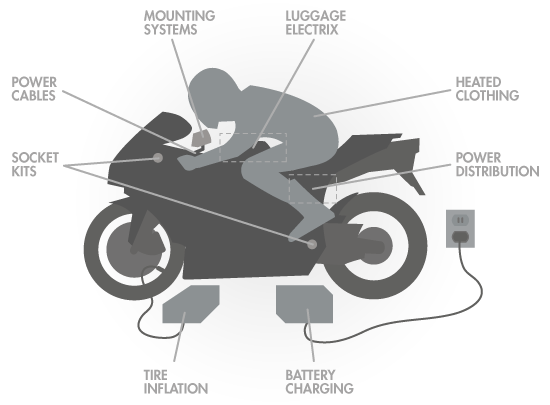 Most electric tire inflaters will require at least a 10 amp fuse to handle the initial surge current (the power required to start the motor spinning). Powerlet currently offers adapter and replacement cables for converting automotive cigarette style plugs to Powerlet plugs. Powerlet will be releasing our state of the art compressor in the fall of 2011.